The office is humming with an especially warm feeling lately. It could be the holidays, but more likely its the excitement over how our upcoming Buy Back the Beach Benefit is coming together. 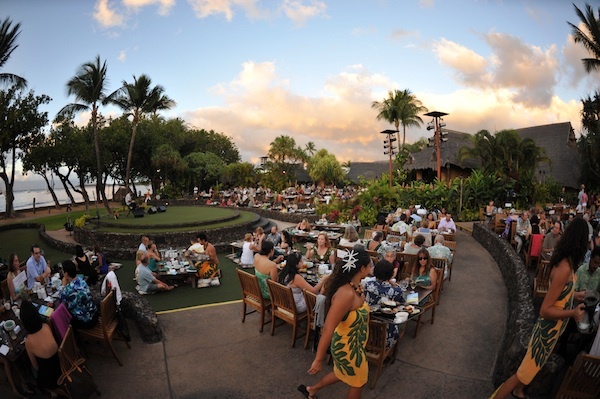 For the 11th year in a row Old Lahaina Luau is hosting the event (insert big applause here! ), and this time around they'll be showcasing their amazing family of restaurants. In addition to the traditional luau spread, guests get to sample tastings from Aloha Mixed Plate, Star Noodle, and the brand new Leoda's Kitchen & Pie Shop. Prepare to eat well! Save the Date: January 28, 2012 — Buy your tickets online here. A true feast for the senses, the night's entertainment includes total "Ahumania" with mistresses of ceremony Joni DeMello and Liz Morales of Ahumanu leading the show. The Old Lahaina Luau dancers will perform and HAPA headlines with a special performance commemorating the 20th anniversary of their first album. We welcome returning event sponsors Mana Foods and Boeing and our new supporters Skyline EcoAdventures and Sempra Generation. Hawai‘i Arbor Day—Way to Grow! Arbor Day—what a great excuse to get your hands a little dirty. We had the honor of participating in some wonderful festivities on Maui this past Saturday, November 5. First, staff and volunteers were on hand at the Maui Nui Botanical Gardens for their annual native tree giveaway. Hundreds of folks turn out to this event every year to learn more about native fauna and which are best acclimated for their yards. We hope that everyone who attended has planted their free tree by now. Another fabulous community gathering was hosted by Skyline EcoAdventures at their Haleakala zip line location. In celebration of Arbor Day and the Plant-A-Wish finale, the zip line company hosted four Maui youth groups in an ambitious endeavor to plant 1000 native trees. Mayor and Mrs. Arakawa were on hand to help Plant-A-Wish, a nationwide tree planting tour, sow their official final tree of the tour, a robust native ohia perfectly suited to the area's misty slope. As apparent to all in attendance, Maui has one hard-working Mayor! He dug in with no delay. Skyline EcoAdventures celebrated all week by offering benefit zip line tours, which raised over $8,000 for local charities, HILT included. On Saturday, Hui Malama Learning Center, Hawaiian Canoe Club's Kamalii Program, and a local Boy Scout and Cub Scout troop provided a small youth army to force the mass planting, which was led by Native Nursery. Hats off to Skyline EcoAdventures for hosting an amazing celebration that not only helped restore the native forests of Haleakala, but also helped local nonprofits flourish and got over 60 Maui youth actively engaged in the spirit of Arbor Day. And congratulations to Sara Tekula and Joe Imhoff of Plant-A-Wish on the accomplishment of their 50 state native tree planting. Way to grow! See more event photos here. Looking for an uplifting experience? Fly the forest canopy to raise your spirits—and a little money for the Land Trust. Take advantage of this special offer for $50 zipline tours at Skyline Eco-Adventures' Haleakala location on Maui. On Tuesday, November 1, as part of their weeklong celebration of Hawai‘i Arbor Day and the Plant-A-Wish project finale, Skyline is generously donating all $50 from the 3:00 and 3:30 p.m. tours straight back to HILT. Share this opportunity with friends and family! Forward this post, or get a group of thrill-seekers together for a fun, flyin' afternoon. On Arbor Day, Saturday, Nov. 5, join Skyline for an extensive native tree planting, more discounted zipline tours, and the culmination of the nationwide Plant-A-Wish project. Skyline reservationists are standing by with more information. Skyline EcoAdventures has long been a generous supporter of the Land Trust. We are grateful for their tremendous philanthropy and love of Hawaii.